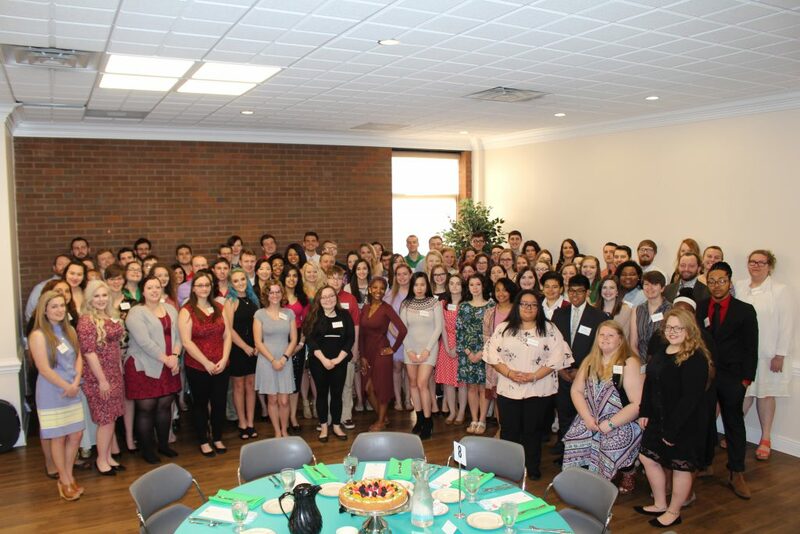 Marshall University donors and current recipients of privately funded scholarships were honored today at a Scholarship Honor Brunch in the Memorial Student Center’s Don Morris Room on the Huntington campus. The event is an annual observance at which donors and the scholarship recipients who benefit from their generosity are able to meet. Mary Bunten, 22, a scholarship recipient and biotechnology major from Huntington, addressed the audience and discussed what she refers to as “planned happenstance. “Planned happenstance is a term coming to be known as both an attitude that you gain and actions that you take. It is the ideology that you can create opportunities by taking action on your curiosity without letting a certain ‘path’ pin you down. Throughout my journey at Marshall, I lived the planned happenstance way of life and I was greeted with success and adventure beyond my wildest expectations,” Bunten said. 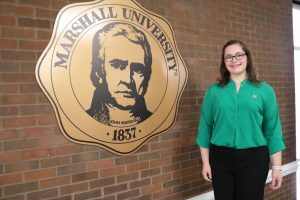 Recipient of the Nancy Pelphrey Scholarship for Marching Band, Flag Corp and Dance Team, Bunten said her time at Marshall has prepared her to pursue her Ph.D. in genetics, genomics and bioinformatics this fall. A scholarship recipient during his undergraduate years, Marshall President Jerome A. Gilbert spoke at the brunch about the importance of opening doors through financial support at the university level.  Dr. Ron Area, chief executive officer of the Marshall University Foundation, said the foundation will continue to sponsor events like this to recognize donors and recipients. Area said more than 400 people attended today’s event, including donors, scholarship recipients and members of the university community. To learn how to establish a scholarship to help students succeed, contact Krystle Davis at the Marshall University Foundation by phone at 304-696-6781 or by e-mail at nichols50@marshall.edu. Pictured: (Above) Scholarship recipients at Marshall University pose at the annual brunch on April 14. (Below) Mary Bunten, senior biotechnology major and scholarship recipient, was the featured speaker. Listen to Mary Bunten’s remarks here. To visit past years, please follow the links below.